Using a map is an essential requirement. The itinerary has no special marking. In some parts the itinerary shares parts with the GR 11, where we will find red and white marks. 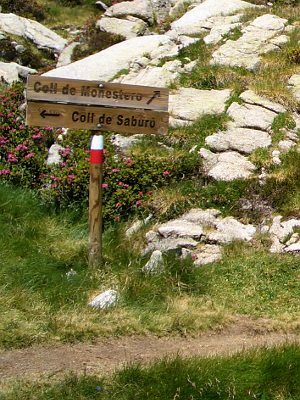 Other parts are marked with wooden posts painted in yellow, and most of the time we will follow the route thanks to the milestones (a heap of stones) that other mountaineers left before for us. Using a map is an essential requirement. 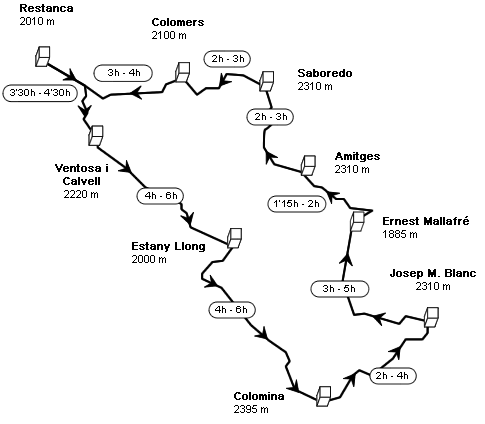 The crossing develops totally along a high-mountain terrain, with granite blocks, landslides and paths that keep alternating in each of the stages. It is a card that will be marked with a stamp in each of the refuges we go past. It costs 20€ and with it you get an exclusive cap and a map of the itinerary on a 1:50000 scale form the expert name in maps, Editorial Alpina. If you are uncertain about how to organise the stages, we can help you.